We're OK so far. Taranna was the fire front for a while yesterday/last night, with a major fire starting from embers down our drive. We phoned the local fire chief and left a message but the fire was taking off so fast that we dialled 000. We were asked what country, how do you spell Taranga, where was Taranga and so on while the flames kept getting bigger. By the time we had spelled the address, a fire truck was coming up our drive. I guess the fire chief had listened to his messages. That fire turned into 6 appliances on our drive 10 minutes later, to 3 helicopters operating continuously ferrying water from the bay. There's still a potential for more fires to take off - it all depends on the wind and the temperatures, both of which are forecast to increase today. 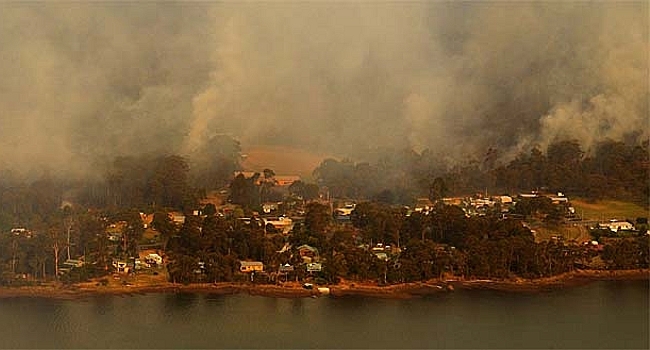 The Dunally/Murdunna fires were truly horrendous. On Friday night we could see the entire N horizon was smoke lit from below with a deep red glow. By 9:30 huge flames could be seen leaping up above the hilltop. Soon afterwards the fire began moving down the hill, looking like those eerie volcanic lava flow shots! On ground services are excellent. Road apparently can't be opened for 1-2 weeks but I reckon that with the application of a Royal visit everything would be fixed in a day or two - even paint the trees a natural colour! Communications are parlous (maybe we should declare telecoms an essential service? ), with our land line totally disconnected, mobile towers down and no integrated information about what's happening, making impossible to know whether it's worth the risk of defending or not. 2,000 people, many holidaymakers, were stuck in Nubeena there, basically on the sports ground and civic centre. There was word of a special 'emergency' septic tank draining by Peninsula plumbing. Am I alone in spotting a contradiction here? You'd think it might be time for the feds to acknowledge that telecoms is an essential service - be interesting to see how they propose to govern the country without telecommunications! Overall the people seem to be doing pretty well. Having the peninsula isolated with only a single road suggests that in the event of an emergency, ferries should run say 2x per day to let people go to town to shop etc, clear out visitors and assure essential supplies can get in and out. That idea seems to transcend the government so far. The government has offered people $750 for being displaced (or something) - OK and wouldn't it have been good to have used the money in prevention and emergency response? Apparently Julia is visiting today so everything should be OK after that.